I think I've mentioned in the past, that I do not have a "green thumb". I am hoping that this is something that can be "learned" and isn't just an innate ability that some have and some don't. I've tried to grow herbs before, but admittedly, didn't investigate how to actually do it. I just bought a pot, some potting soil, and had absolutely no clue. So, this time I "googled". 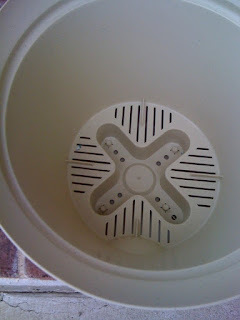 I learned that "drainage" and "location, location, location" are key to the success of growing herbs. 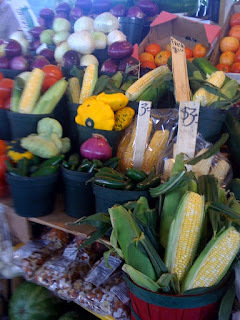 I bought these at Dallas Farmers Market. One stand was selling them 3 for $5.00. 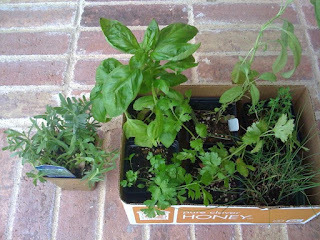 I bought cilantro, thyme, basil, chives, italian parsley, and sage. I bought lavender at another stand for $2.00. 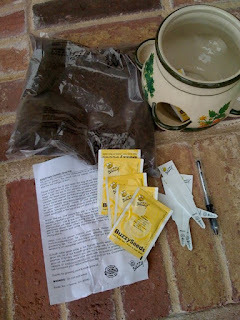 Seeds Herb Ceramic Pot" kit . It comes with 6 packets of seeds - cilantro, marjoram, curly parsley, chives, sweet basil, and thyme. 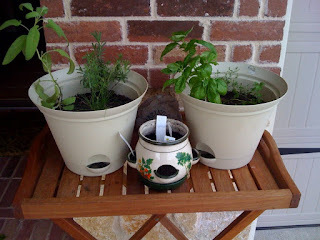 So, I will be conducting a test to see what survives.. the potted plants or can I really grow herbs from seeds? Again, a little overwhelmed at Walmart. Almost left the store with something that was only filler and not potting mix. Shew.. that would have been frustrating. Then, it was a decision between this and Miracle Grow. 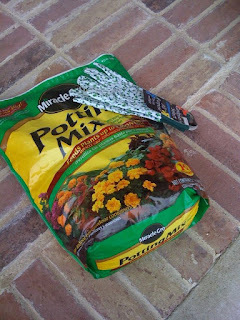 The Potting Mix won because it was a dollar cheaper, and I could plant both pots with one bag. Again, until I learn how to be a gardener, I'm keeping my investment low. Even the gloves were only .97 cents. So, not the "vision" I've always had in my head, but they are planted. I know the Buzzy Seeds pot looks funny with the plastic labels sticking out, but how else am I going to remember what seeds I planted? The official experiment has begun. Will I be able to keep the herbs from Farmers Market alive? Will I be able to actually GROW herbs from seeds? Well, stay tuned.. I will keep you posted. These are spices from Kurry King. I didn't really need any spices. When they had me smell the cinnamon, boy, was I ever hooked. It was the BEST cinnamon I have ever smelled. 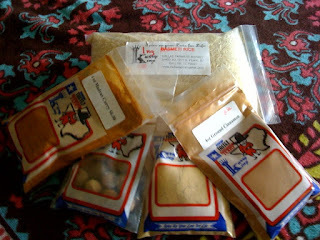 I ended up buying curry, cinnamon, ginger, whole nutmeg (so I can grate it just like they do on Food Network), and basmati rice. I had to rush home and put the curry in the freezer. It's so strong, I was afraid my house would always smell like an Indian restaurant. A little curry goes a LONG LONG way. Lemon Basil Linguine - Yum! 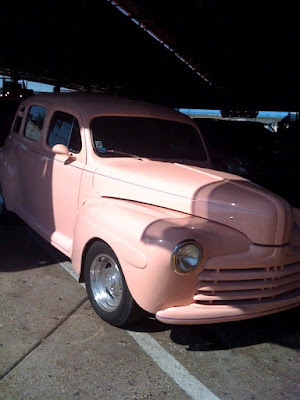 ... but not sure about "pink" hair. If you look closely in this picture, you'll see the back of a girl's head with pink pigtails. 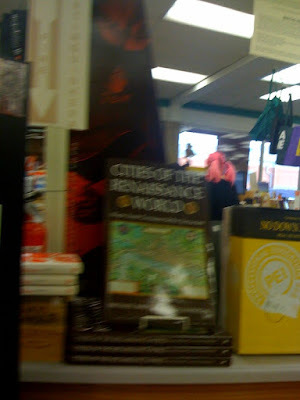 That is REAL pink hair on a real person.